Harvey and Donna Smith purchased their farm in New Haven, Vermont in 1972. 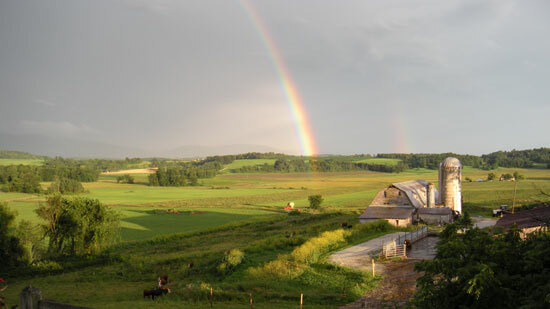 Located in the fertile Champlain Valley, the farm is located in the northern-central part of Addison County. The Smiths ran a successful dairy operation until 2005 when they sold the cows. In 2006 they purchased eight Hereford cows to start building their herd of beef cattle—now at around 90 head, with 30 brood cows, 24 calves and 35 feeders. They raise Hereford and Angus/Hereford crosses—breeds well-suited to the Vermont climate that thrive on a primarily grass diet, to produce nutritious, tender and flavorful all natural meats. The Smiths have been pasturing cattle since 1980, and through a whole-farm nutrient management plan, crop rotation, and intensive rotational grazing they have developed excellent pastures that they continue to improve every year. Their nutrient-rich soils produce an abundant source of nutrient-dense feed for their animals on a year-round basis, resulting in consistently high quality meats. Smith Family Farm participates in USDA Natural Resources Conservation Service programs to improve soil and water quality and wildlife management on the farm. Located in the Little Otter Creek Watershed, the Smiths have established about six acres of stream-side buffers, on both sides of Little Otter Creek, to help protect water quality while providing a great area for wildlife. The farm is visited each spring and fall by large numbers of waterfowl and other migratory birds. In 2011 Harvey and Donna Smith chose to conserve 265 acres of their farm and forestland with the Vermont Land Trust. The conservation easement ensures that the land will never be developed or used for purposes other than agriculture, forestry or recreation. The sale of their development rights has also enabled them to improve the farm’s infrastructure and add a walk-in freezer to store their meats. They currently use approximately 250 acres in the farming operation with the remainder in managed forestland production and wildlife habitat. Truly a family business, daughters Sara and Amy worked with Harvey and Donna as they developed the dairy operation. Now that the farm has been diversified to produce hay, corn and soybeans, along with Vermont grass-fed beef, pork and poultry, their granddaughter AnnaJo Smith has become an active member of the team. Amy has a home and a daycare center on the farm. Sara also has a home on the farm, much to the delight of the children she cares for. Smith Family Farm is committed to growing high quality meats for their customers at a price they can afford. Five percent of their profits are given back to the community to support youth organizations such as 4-H, Boy Scouts, Girl Scouts, and Future Farmers of America, along with community- based organizations to include the Middlebury Lions Club, Addison County Chamber of Commerce, Beeman Elementary School, New Haven Congregational Church Foodshelf, and New Haven Volunteer Fire Department. © 2013 Smith Family Farm. Site produced by Pam Knights Communications, Newcomb Studios, and Raven Isle Graphics Salt Spring. Funded in part by the VT Farm Viability Program.